Island profile: What hasn't Peter Vielbig done? 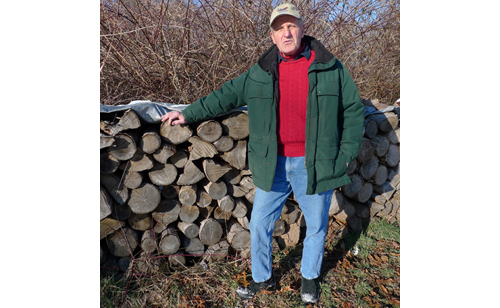 PETER BOODY PHOTO Peter Vielbig at his wood pile on Cobbetts Lane that he cut, chopped and perfectly stacked himself. How many officers in any local police department have founded their own companies, served meals to presidents and governors, sailboat-raced to Bermuda, whipped up gourmet meals for blue-water crewmates, had their kids tackle ballet as well as hockey as fundamental life lessons, performed on stage in “Brigadoon” and other musicals, played football in high school, college and the Coast Guard, danced in “The Nutcracker” or sung under the direction of the great Itzhak Perlman? Shelter Island’s deceptively soft-spoken 73-year-old Town Bay Constable Peter Vielbig is no chest thumper. “I’m not that talented,” the self-taught guitar player said in an interview last week, admitting he was never a great guitarist, singer, football player, dancer or rowing competitor — he crewed in shells in Princeton, where he lived and worked and raised a family with his wife, Gail. What he thumps his chest about are the people he loves on Shelter Island and, it seems, everywhere else he’s spent time. “Before we moved here, we knew we would like Shelter Island but not how much we would love it,” he wrote in a memo he prepared for this interview. Peter is not one to leave details to chance. It’s one hint of the energy and drive that fueled his many achievements, from a college scholarship that required him to work in the kitchen to his recently earned 50-ton U.S. Coast Guard master’s license. He counts many local people among his idols and close friends, from the late Walter Brigham and Scratchy Johnston to John Kerr and Charlie Brigham. He sings the praises of his fellow police officers and his younger mentor, Butch Labrozzi, the town’s other bay constable, for having trained him well after Chief Jim Read and the Town Board hired him in 2007. He’s not one of those city folk who think only other city folk know how to make the world go around. An elder at the Presbyterian Church, a member of its choir as well as the one who performs with the chorus at the Perlman Center, he’s also chairman of the town’s Two-Percent Committee, which manages the town’s Community Preservation Fund. Peter is about as local as a man can get who had a long and successful career working for himself, founding two companies and raising three kids with Gail, in the “fun and exciting” cultural world of Princeton, as he describes it. He learned the business in college, where he worked for Hobart’s food services contractor washing dishes and cooking. The same company, Saga Food Service, latter recruited him to manage its operation feeding the “eating clubs” of Princeton. Even though he’d lined up contracts for more, the firm decided to move its operations to California. So he stayed and founded his own company. Still the principal owner, he’s in the process of turning it over to an employee. A second company, founded in the 1980s and sold in 2000 to Horizon Software, developed a program he called “The Lunch Cruncher” that helped schools file for reimbursements for their federal lunch programs. Peter figured it out himself fooling around on an IBM PC back when 512 kilobytes was a lot of RAM. “It wasn’t rocket science,” he said during a talk last week at the farm-style house he and Gail built on Cobbetts Lane in 2003; he was the general contractor for the project, which is meant to look like the typical old Island farmhouse expanded by cozy additions over the years. Now, during the boating season, he takes his orders from the chief of police — “a new experience,” he said, and one he finds liberating. He carries a Glock and wears a uniform and a badge. The Baldwin, Long Island native learned to love boating, fishing and clamming from his Brooklyn-born father, Leonard, a lawyer who worked for the Equitable. As one of the town’s two bay constables, he cruises the waters solo for eight hours five days a week in season, not including emergency calls. “Hey Vielbig, what are you doing?” Detective Sergeant Jack Thilberg asked during one 3 a.m. phone call, as Peter remembers. He answers boaters’ questions, helps them with problems and sometimes respectfully and politely assists the Police Department making arrests for boating while intoxicated. Last year, Constable Vielbig assisted in four BWI arrests, more than half of the seven-arrest total for all the marine units operating on the Peconic Bays season. He’s not shy about getting tough when the circumstances call for it. “I’m saving them and their family members from disasters,” he said. He cooks a hearty, rich clam chowder, Manhattan or New England. His father was a great cook. So is his daughter, Leslie, who lives with her family in Wellesley, Massachusetts. Son Alex lives in San Francisco working for specialty food purveyor Trader Joe’s. Son Laird was a successful chef who worked at the East End’s hottest restaurants. As many Islanders know, he died in 2003 and the family and friends sponsor a scholarship in his memory at the Shelter Island School. All the Vielbig kids grew up working in the family food service businesses. Good cooking and fresh, healthy ingredients were part of Peter’s business model and remain part of his life — as proven by the chowder made with local clams he served during this interview. Add hockey and ballet as ingredients of their kids’ educations. They lived one golf course away from the headquarters of the renowned Princeton Ballet Company, where Gail worked part-time. “We wanted our kids to be part of that,” Peter explained. A Verity skiff and gaff-rigged oyster-style sloop spend the winter in his backyard on Cobbetts Lane, which is bordered by a impressively long and neat wall of firewood that he cut, chopped and perfectly stacked himself. It’s the only source of fuel for the radiant heating system in the house, where classical as well as country music often play in the background. He calls the furnace “Mabel.” She requires a lot of attention. Romping in the snow along the wood pile is his white-whiskered black Lab Bridget, whom he and Gail raised to become a seeing-eye dog but took back when she proved “too friendly” for that line of work. Many roads led Peter and his wife, their kids — and now their three grandkids, who come every summer — to Shelter Island. (It was Charlotte who, at age 10, declared the library should host a “turkey plunge” to raise money. The Vielbigs passed on the idea and today it’s an institution.) A cousin owned a little cottage off Cartwright Road called “Kindhearth.” Family reunions still take place there every summer. As kids, Gail’s mother and aunt went to the camp now occupied by the Perlman Music Center. Gail’s father was a sailing instructor there. Peter’s parents rented in East Hampton when he was young and, in 1961, built a second home of their own in North Haven. Yet another thread that connected the family to the Island was Peter’s Princeton neighbor Ed Miller, who kept his Hinckley Pilot, Guinevere, at Coecles Harbor Marina. Peter was a regular crewmember on cruises aboard that boat, which led to other crewing gigs during which he did all the cooking. Gail was office manager of Princeton University’s Sexuality Education, Counseling and Health Program and later administrator of the undergraduate anthropology department. Now, after courses at Southampton College and a 4,000-hour internship, she’s a behavioral health counselor on staff at Eastern Long Island Hospital. Like her husband, she has transformed herself at a time in life when many people settle in to a cozy retirement.